Every year macs never fails to launch a samurai burger promotion. This year is no exception. The samurai burger (basically just a beef burger smothered with a special umami sauce) does not quite attract as big a queue as the ubiquitous hello kitty but nonetheless boasts a loyal following of is own. Me? I'm not a fan of burgers but I simply adore Mac Donald French fries. 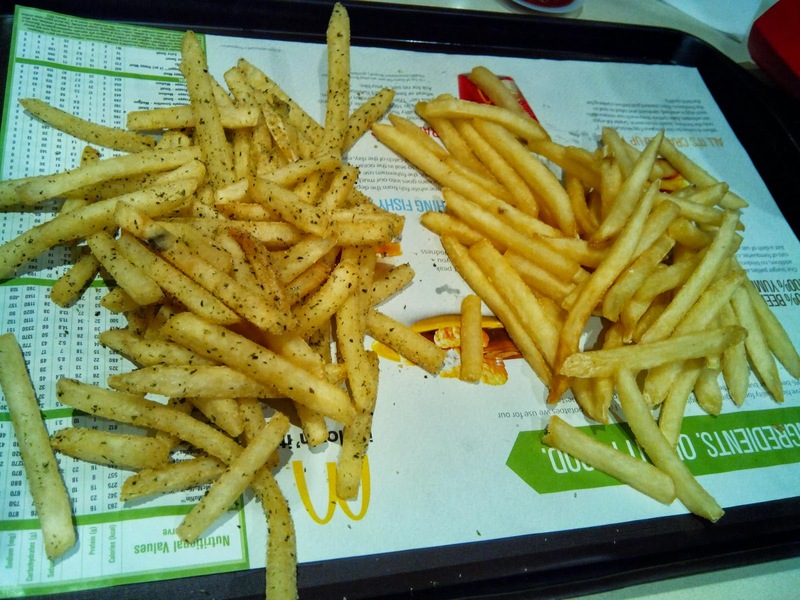 To complement the samurai burger (as well as milk the pockets of consumers like me) macs has concurrently launched a flavoured French fry pairing called seaweed shaker fries. Basically its a satchet of seaweed and msg laced powder that u liberally shake over the fries, resulting in macs' version of "mamee". This flavored French fry is arguably the best loved flavoured french fry macs has introduced to date. Alas. Some things are pretty to look at but fail miserably in the taste department. 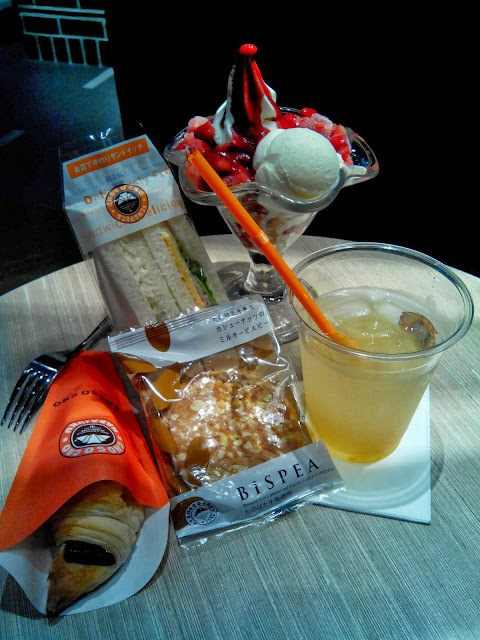 We suddenly feeling finicky and decided to try various items from the cafe. I had a high overpriced glass of ice citrus tea which tasted v ordinary. Sandwiches don't wow either (pictured here is a tuna potato sandwich as well as a ham and cheese sandwich). The desserts are definitely the main draw. My strawberry heaven sundae comprised a generous blend of sourish sweet strawberries, vanilla ice cream and cubes of light sponge (made even more pleasurable by the surprise discovery of cornflakes hidden right below). Equally impressive was the chococro which can be taken away in a box of 6. Who can resist rich gooey chocolate spilling out of a buttery crusty croissant? Oh yes. One final item. That immaculately wrapped biscuit is just an ordinary tasting and slightly overpriced peanut cookie. I certainly wouldn't be ordering this again.